Say hello to clear pores and get camera ready with this facial sheet mask with serum. Juicy Strawberry helps to cleanse pores, while a burst of Mint helps to control oil and reveal a fresh, clear complexion. Perfect for normal to combination skin. Strawberry cleanses pores while Mint helps control oil and refreshes skin. Water/aqua/eau, Glycerin, Dipropylene Glycol, Ethylhexyl Palmitate, Glycereth-26, Dimethicone, Peg-100 Stearate, Glyceryl Stearate, Cetearyl Alcohol, Macadamia Integrifolia Seed Oil, Menthyl Lactate, Xanthan Gum, Carbomer, Mentha Piperita (Peppermint) Leaf Extract, Citrus Grandis (Grapefruit) Fruit Extract, Fragaria Chiloensis (Strawberry) Fruit Extract, Salix Alba (Willow) Bark Extract, Hydroxyacetophenone, Phenoxyethanol, Ethylhexylglycerin, Butylene Glycol, Disodium Edta, Arginine, Fragrance/parfum, Hexyl Cinnamal. I just recently bought this and when I first took it out of the package it was coated with a creamy substance. Then I put this on and I must say...you need to give this a try! It has a light cooling feeling on the skin(the mint) that is not over powering and and smells amazing. I love the sheet masks I buy from Sally's so I will be adding more of these to my collection! The mask smells really good, and is quit refreshing. Ive only used the product a couple times however. 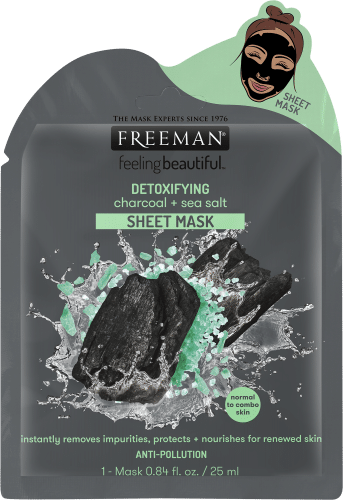 I love all the Freeman’s face masks/sheets. They are super affordable and work wonders! This strawberry/mint one smelled so good! Left my face feeling rejuvenated and baby smooth. Easy to apply and remove. I always buy mine from Sally’s they are about two dollars each or whole bottles (not of this exact kind) for four bucks. Tons of variety to choose from, there’s one or five for everybody!